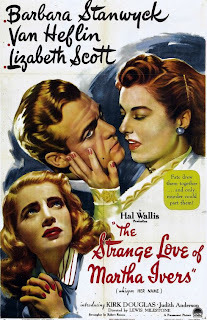 The Strange Love of Martha Ivers (1946) was a movie I bought for $2.97 in a bargain bin at the Warehouse. I am quite the bargain hunter when it comes to dvds (and certain groceries which are multibuys. You save heaps when I'm around). Well, three months after buying it I decided to watch it. One reason was is because I love Barbara Stanwyck, she was so beautiful and talented. Surprisingly, she wasn't in this film a lot. Her top-billing was just a case of getting people to watch it because she was so famous back in the day. The stars of the film, I felt were Van Heflin, Lizabeth Scott and Kirk Douglas (who was in his first starring role, and didn't get billed at all). Stanwyck was a mere actress on the side. Despite that, she churned out an average performance, not as great as the one she did in The Lady Eve, but still good. However, Lizabeth Scott was brilliant, and I found out this was only her second role. I felt she was the female lead in this. The story was warped, it starts with a young Martha Ivers killing her aunt after running away with her friend Sam (who Van Heflin later plays). Walter (later played by Kirk Douglas) watches on as the murder takes place. 18 years later, Sam returns to Iverstown, to meet Toni (Lizabeth Scott), a woman just released from jail. They strike an unlikely relationship, but Sam meets Walter again, and finds that he is now married to Martha Ivers. All sorts goes on in this film-noir, with a chilling end which left with a scary nightmare to deal with once I went to sleep. Good film, questionable story.